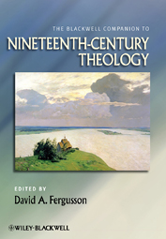 Bringing together a collection of essays by prominent scholars, The Blackwell Companion to Nineteenth Century Theology presents a comprehensive account of the most significant theological figures, movements, and developments of thought that emerged in Europe and America during the nineteenth century. Representing the most up-to-date theological research, this new reference work offers an engaging and illuminating overview of a period whose forceful ideas continue to live on in contemporary theologyA new reference work providing a comprehensive account of the most significant theological figures and developments of thought that emerged in Europe and America during the nineteenth century. Brings together newly-commissioned research from prominent international Biblical scholars, historians, and theologians, covering the key thinkers, confessional traditions, and major religious movements of the period. Ensures a balanced, ecumenical viewpoint, with essays covering Catholic, Russian, and Protestant theologies. Includes analysis of such prominent thinkers as Kant and Kierkegaard, the influence and authority of Darwin and the natural sciences on theology, and debates the role and enduring influence of the nineteenth century âanti-theologiansâ.